Deep smoky caramel married with dark chocolate makes for an addicting sweet condiment. Keep this Chocolate Caramel Sauce on hand when you feel a craving coming on. Or when you’re having friends over. And it’s incomparable as a DIY gift. The trick to making caramel is taking care. Make sure to use a pan that is deep enough or the sauce will bubble over when the cream is added. A 1 – 1 ½ quart pot is ideal. Keep an eye on the sugar as it caramelizes. It will take some time, 8 –10 minutes. As the water evaporates and the sugar begins to caramelize, the sugar browns very quickly. Be ready to remove it from the heat because it can burn in an instant. Add the warm cream slowly, stirring it constantly with a whisk to reduce the bubbling. I do this over a clean kitchen sink. Easier to clean up any spills. Choose a dark bittersweet chocolate that melts easily. How can you tell? Pop a piece of it in your mouth and gauge how it melts. Does it just sit there all dry and sticky? Or does it melt into a silky mass on your tongue? Or rub a piece between your fingers. Does it melt quickly and easily? These are good indicators of cocoa butter content. More cocoa butter will make for a lighter and smoother sauce. Ghirardelli at the grocery store should work. Do you need any serving suggestions? I think not. Eating it with tiny espresso spoons is as good as any. I like it over a more sour ice cream such as frozen yogurt. And if I were making ice cream from scratch to go with it, I’d use some creme fraiche or sour cream in the custard. This recipe is adapted from the one my co-author Eddy Vandamme created for the 4th edition of our textbook, On Baking: A Textbook of Baking and Pastry Fundamentals. Pour the sugar into a medium size heavy gauge sauce pan. Add the water and lemon juice without stirring. Place the pan over medium high heat. Dip a brush into cold water and run it along the inside of the pan to wash down any sugar crystals that may have clung to the sides of the pan. Heat the cream in a small saucepan while the sugar cooks. Cook until the sugar melts, bubbles and begins to darken. This will take 8 – 10 minutes. Watch carefully as the sugar darkens. Once dark spots appear, the sugar will caramelize quickly and can burn easily. Pull it off the heat when it reaches a deep mahogany color. Using a whisk and, working over a sheet pan or your kitchen sink, stir in half of the heavy cream. The mixture will bubble up and boil over if you add it all at once. Whisk in the remaining cream stirring until the mixture is smooth. Add the butter, salt, vanilla and chocolate. Whisk until the sauce is smooth and glossy. Let the sauce cool slightly then pour it into one or two clean jars. Cover and refrigerate for up to 2 weeks. Reheat in a microwave oven or over simmering water. 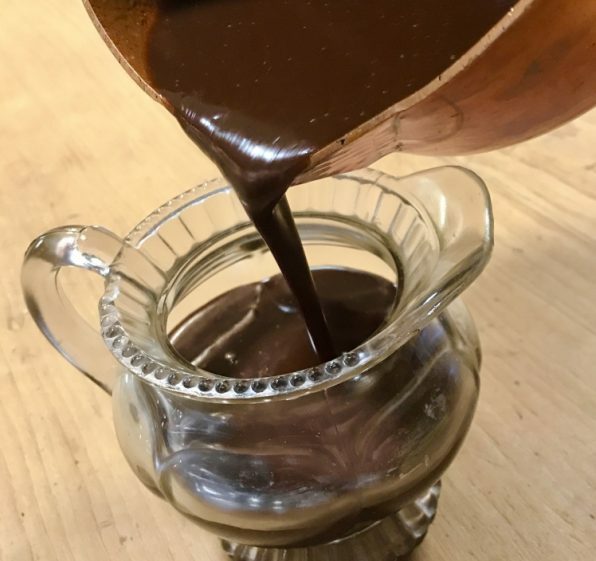 Variation Salted Caramel Sauce - Omit the chocolate. Increase the salt to ½ teaspoon. If you like, use large flake salt such as Maldon.